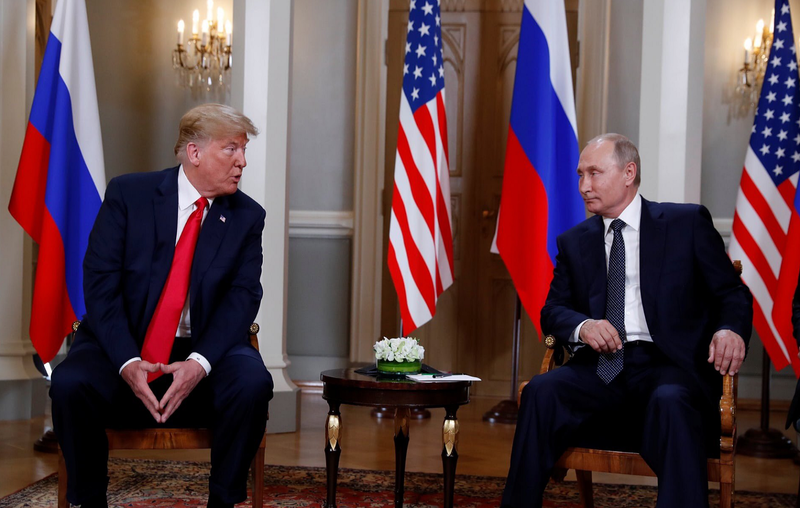 This afternoon in Helsinki, Finland, US President Donald Trump met Russian President Vladimir Putin for first a two-hour one-on-one meeting followed by a working lunch with advisers. The US President believed he would have an ‘extraordinary relationship’ with Mr Putin. Mr Putin stated it was time to discuss "difficult multi-national issues" with his US counterpart. After their one-on-one meeting, the two presidents were joined by their respective teams for a working lunch. On the American side of the table, we could see: Russia expert Ms Fiona Hill, US Secretary of State Mr Mike Pompeo, US President Mr Donald Trump, US Ambassador to Russia Mr Jon Huntsman and National Security Adviser Mr John Bolton. Mr John Kelly, the White House Chief of Staff was also present. On the Russian side of the lunch table, there was Putin’s press secretary Mr Dmitry Peskov, Foreign policy aide to president Mr Yuri Ushakov, Russian President Mr Vladimir Putin, Foreign Minister Mr Sergei Lavrov, Russian Ambassador to Washington Mr Anatoly Antonov and lastly the Head of North America department of Russian foreign affairs ministry Mr Georgy Borisenko. I honestly like Gold water's non-biased reporting. They just say what happened and not give unneeded political/social commentary. Thanks a lot!